Ask students a quantitative question in non-mathematics context -- a question that requires consideration of numbers, tables or graphs, and/or a calculation or estimate. Then ask the students to build a spreadsheet to answer the question. What mathematics applies? How do you do the mathematics? How do you design the spreadsheet to calculate an answer? What cell equations belong in the cells? In short, ask students to figure out How to Solve It using the software that resides in the technology sitting on their desks. USF Geology students students being introduced to their first SSAC module, How Large is a Ton of Rocks? Photograpy by Dorien McGee, Sept 2006. Teaching to promote quantitative literacy, the habit of mind where one engages quantitative problems in relevant context. Every course that uses tables and graphs is an opportunity for students to become more quantitatively literate. Every field that bases its arguments on quantitative relationships is an opportunity for students to think quantitatively. Students develop QL skills when they work through (solve) problems that engage them. What is Teaching with SSAC? -- Students build spreadsheets and apply relevant mathematics to solve problems in context. Title slide of a module in the 2006 series. Teaching with Spreadsheets Across the Curriculum means teaching with SSAC modules. SSAC modules are short PowerPoint presentations that guide students to build spreadsheets to solve one or more mathematical problems in the context of their courses. The students determine the cell equations that produce the calculated numbers shown on the spreadsheets. What is Teaching with SSAC? - A more detailed description. -- To help students develop know-how of mathematics that is relevant to them. Slide from "Predator-Prey Interactions -- Modeling the populations of fishers and porcupines in NH" by Ben Steele. The Third Principle of SSAC: Building spreadsheets to solve a problem is problem-solving. -- The question is not how much mathematics the students know; it is how easily they access it. Why Teach with SSAC? - An assessment of the benefits of using SSAC. How do you use SSAC? -- Find relevant modules and adapt them to your class. Have your students work through your modules to enhance their mathematical know-how. They will better understand the content of your course. They will become more quantitatively literate. Making a new module from an old module. Courtney Kniss, Undergraduate TA (Eckerd College), Workshop 2007, Olympia WA. SSAC modules can be used as homework activities that preceed or follow lecture. They can be used as in-class, interactive, individual or group activities. The modules can also be used as demonstations in lectures for which the students previsit or revisit the material at their own speed before or after class. 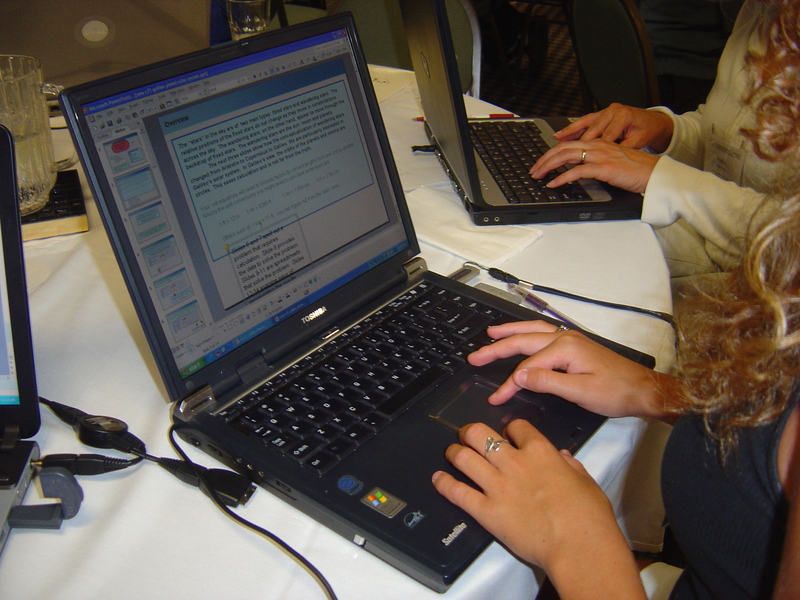 However they are used, modules require a computer with PowerPoint and Excel. Because the modules are in PowerPoint, they can be easily tailored to the specific needs of the instructor or class by adding or subtracting slides. Modules can be mixed and matched with other modules. How to Use SSAC - Tips for instructors and students using SSAC. The modules posted at this site are student versions. Spreadsheets in the student versions of the modules are embedded as pictures, not worksheets. Thus clicking on the spreadsheets of the student versions does not activate Excel. Instructor versions, in which the spreadsheets can be activated to reveal the equations, are available on request. An online request form can be activated via a link under "Teaching Materials" in the module descriptions available at the "access to the modules" link. Encyclopedic dictionary on spreadsheets: Mathsnet's "The A to Z of Spreadsheets"